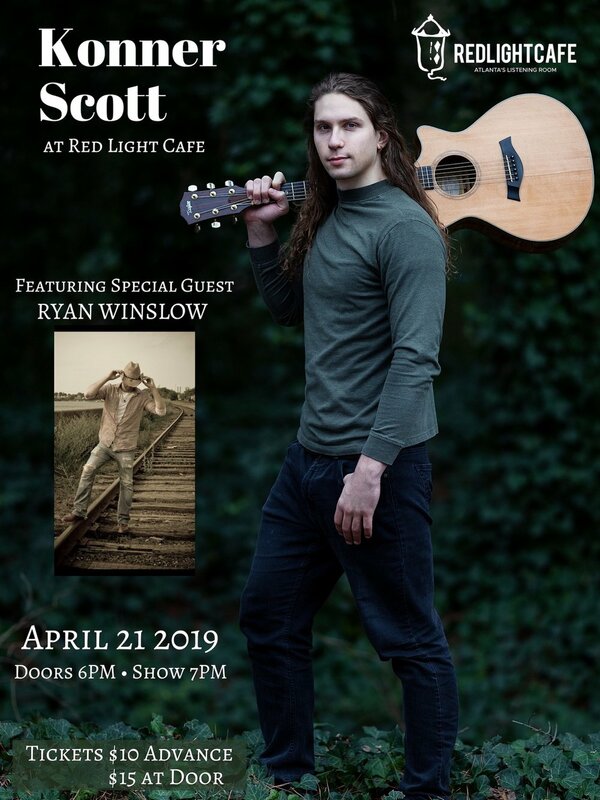 Come join singer, rapper, and songwriter Konner Scott for his first full-length live show in over a year! Special guest Ryan Winslow opens the show at 7pm. Konner Scott is an Atlanta-based freelance songwriter, composer, and instrumentalist. He draws influences from all varieties of music styles, which primarily include rock, classical, folk, blues, hip-hop, pop, and R&B. He boasts a prolific songwriting portfolio containing 300+ original tunes, the bulk of which cover a wide variety of genres and styles. He is a versatile multi-instrumentalist, specializing primarily in guitar and piano. In addition to his writing and performing background, Konner has a profound passion for music production and engineering, and during his free time, he also dabbles in rap and poetry. Ryan Winslow is a classically trained Country-Western singer-songwriter from Bozeman, Montana. He’s most easily found somewhere between good music, good food & good company.